Baklava, pakhlava, paxlava… Not the kind of traditional baklava that Vera prepared a few months ago and that is made with phyllo. Because this month, we are visiting Azerbaijan. Azeri baklava is typically prepared with a dough that is not as crispy and without the multitude of layers of the traditional baklava, although, depending on the region, there may be several layers. Tea and sweets after a meal are extremely important for Azeris. The cuisine of Azerbaijan is rich in more than 30 varieties of desserts, with a majority of them containing nuts, almonds, sesame seeds, poppy seeds, ginger, saffron or cardamom. 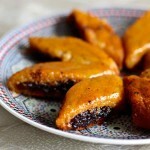 Among the most famous Azeri sweets, baklava comes at the top, but shekerbura is also another favorite. 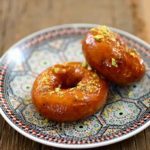 There are so many varieties of baklava around Azerbaijan that you would almost have to know the geography of the country by heart to locate all the recipes. First, the famous baklava from Baku, the capital of the country, known for its thin dough layers enclosing nuts and sometimes almonds, sweet and spiced, covered with butter and sweet syrup. Then comes the baklava from the Nakhichevan region that is in all points similar to the one from Baku but where the syrup is flavored with rose water. 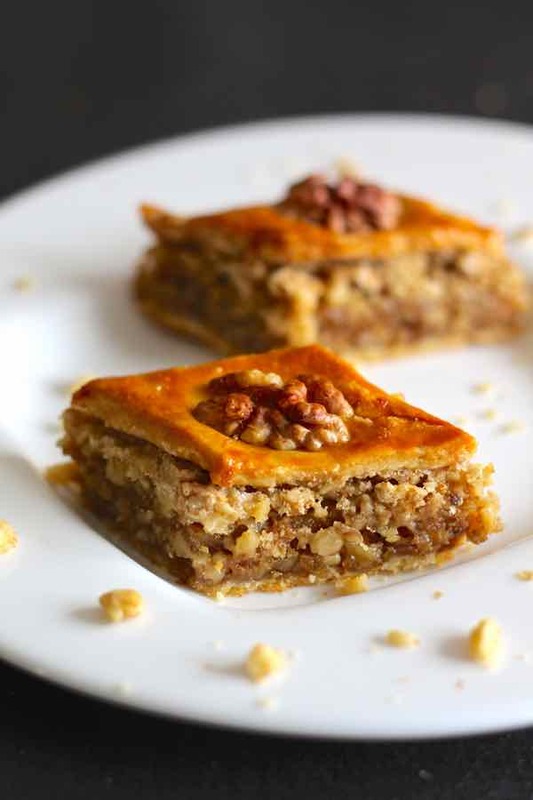 Loaded with nuts and soaked with very aromatic syrup and a saffron infusion, comes the baklava from Skeki. The absolute dream of anyone who has a sweet tooth … very sweet tooth! It is also called skeki halvasi. 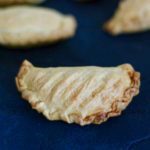 It has the particularity of being prepared with rice flour in large molds and then cut and individually packaged in small boxes. 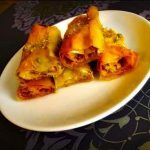 The recipe for this variety of baklava is secretly guarded by the bakers of the city which explains why it is almost impossible to prepare this baklava at home. Then, we’re headed to Ganja! The city of Ganja is known to be very proud of its nut-based baklava flavored with rose water and cardamom syrup. The baklava from Ganja has more dough layers than the one from Baku and rose water is incorporated in both the dough and the filling. 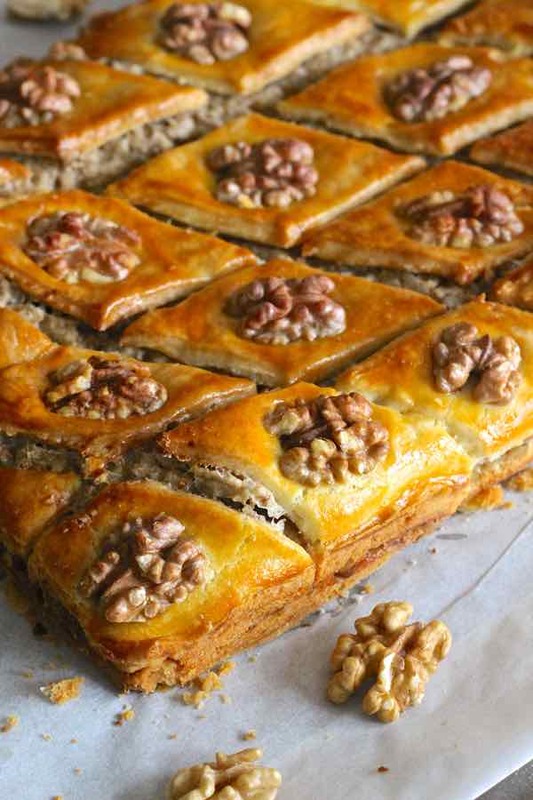 Another characteristic of this baklava is the fact that it is decorated with poppy seeds. For the record, in 2010, a long baklava 45×15 feet was prepared in Ganja. About 20,000 people tasted this baklava whose dough weighed more than six tons. 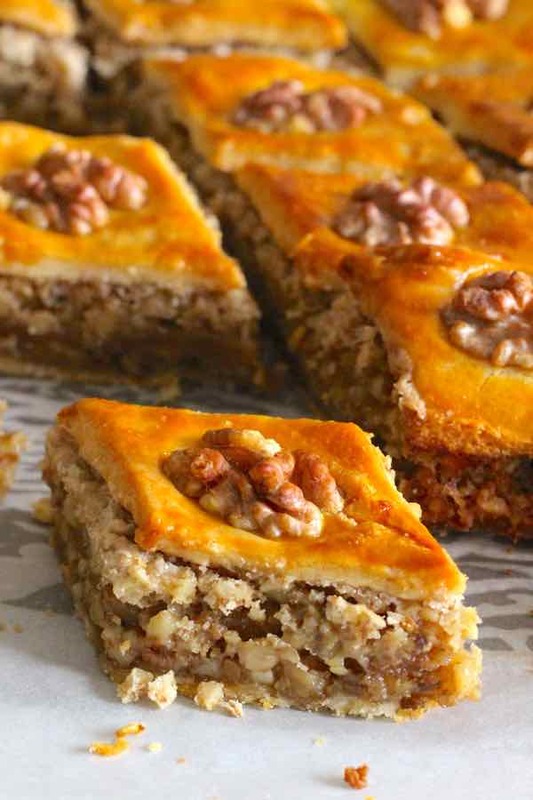 While the Sheki baklava is famous for being square, the one from the Gabala region is famous for its triangular shape and is called uchgulag, which would mean 3 ears, like the 3 sides of a triangle. This baklava is fried in a pan called saj. The pakhlava recipe I chose to prepare today is the recipe of our culinary expert Feride and is one of the easiest recipes for this dessert. 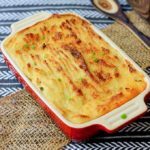 One can even say that this recipe is for lazy people! In fact, the full name of this pakhlava in Azeri is tenbel pakhlava, which can be translated to… lazy pakhlava! 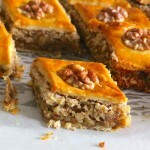 In Azerbaijan, this baklava is also called sochinskiy pirog. I prepared this tenbel pakhlava with Vera during my short stay in Paris last week. For this dinner with the family, we also prepared parcha-dosheme plov (a pilaf recipe from Azerbaijan with chicken and dried fruit that I will share next week). Everyone loved the dessert, especially my father who typically hates Middle Eastern pastries that are drenched in sweet syrup. We even had some of this simple and dry version of pakhlava during our poker game the day after and everyone loved it! I will make this pakhlava again very soon during the cooking class that I am hosting with Feride on June 5th in Los Angeles. So if you live in the area, you have to register and join us, it will be a lot of fun! 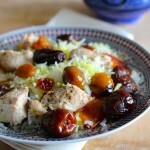 This recipe is validated by our Azeri culinary expert Feride Buyuran from AZCookBook.com. Tenbel pakhlava (lazy baklava) is the recipe of a delicious and easy to make baklava from Azerbaijan. In the bowl of a stand mixer, beat the flour and butter. In a separate bowl, mix the sour cream and baking soda and incorporate to butter and flour mixture. Stir in the egg yolks one by one. Mix and knead briefly until smooth and incorporated. 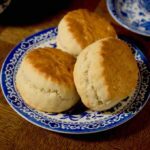 Divide dough into 3 equal pieces. Form each dough into a thick circle. 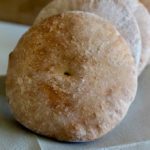 Wrap each circle in plastic wrap and refrigerate for 3 hours. Beat the egg whites and sugar for 3 minutes at medium speed. 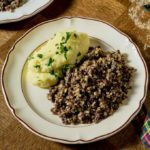 Add the ground walnuts and stir with a wooden spoon to mix. Grease an 8x12 inch rectangular pan. Preheat oven to 350 F.
Dust the work surface with flour. Using a rolling pin, roll the first piece of dough to the dimension of the pan and a thickness of ⅛ inch. Place the dough at the bottom of pan and press the bottom and the sides. Spread half of the nut filling on top of the first layer of dough. Spread the second dough in the same manner and place it above the nut filling. Spread the remaining half of the filling over the second layer of dough. Place the third piece of dough in the same manner as the first two, by covering the second layer of nuts. Press lightly on the top and on all sides to seal. Brush the top with the beaten egg yolk. 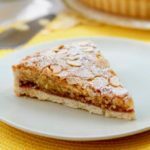 Using a large, sharp knife, carefully cut the pakhlava diagonally with a sharp blade all the way to the bottom of the cake to precut each slice. 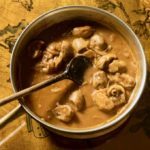 Place a whole shelled walnut on top of each slice. Press lightly with the palm of your hand over the entire surface of the baklava. Bake for 40 minutes or until the pakhlava is golden brown. Wait for the pakhlava to cool completely before manipulating it. Very nice had a piece with a cup of coffee. But I could not eat much of it as its far to rich and sweet for me. But hey that’s to my taste.